500+ in stock Need More ? With 1250 UKCAT practice questions (including a full mock exam), in-depth explanations, and comprehensive tips and techniques spanning over 770 pages, this book constitutes an ideal preparation tool for the UKCAT, helping candidates save time, retain focus and optimise their score. Fully compliant with the new-style UKCAT exam for 2018 entry, the book shows how to approach each type of question (abstract, verbal and quantitative reasoning, decision making and situational judgement) and helps candidates familiarise themselves with all the potential traps that can be laid by the examiners. The overwhelming range of exercises that it contains will enable all UKCAT candidates to refine and optimise their technique to answer questions under strict time constraints. 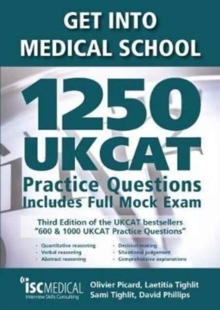 This book replicates the breadth and depth of the different types of questions that can be asked in the live UKCAT test and the spectrum of difficulties that it covers (from normal to stretching), which makes it an ideal preparation tool for all those who want to achieve a high score and maximise their chances of getting into the medical school of their choice.